Sadly, horse riding accidents happen. In this blog we look at what can be done to help riders that incur a serious fall when riding. Specifically, we are looking at accident detection technology and apps that can notify contacts, so they can respond. Accidents from horseback tend to be more severe than other sporting accidents. As was noted as far back as 1991 in the British Journal of Sports Medicine, they have a much higher instance of spinal and head injury. Serious breaks and concussion mean that many riders are often incapable of using a mobile phone following a fall. So, can new equestrian technology help a fallen rider to get help? notify a person (or people) that there has been an accident. They should do this if a rider is unconscious or unable to move. They should not give false alarms. There are several ways of knowing that a horse riding accident has occurred. The first uses a ‘tear line’ or ‘lanyard’ cord that is attached to the horse at one end, and to a rider carried/attached device at the other. If horse and rider are separated, the lanyard is pulled out of the device, and an accident is detected. An evolution of this system uses a Bluetooth link between horse and rider worn devices to note any separation of the two. A different approach is a rider worn device that uses an accelerometer to sense the movement of a fall. This can include both the sudden shock of the fall and/or subsequent motionlessness. Another way of detecting an accident is tracking rider motion using GPS. If a rider becomes stationary the system detects this as an accident. The last system is a combination of the above to give greater accuracy and fewer false alarms. Having noted that an accident has occurred, all products and apps use GSM text messaging for alerting nominated contacts. Obviously, the rider needs to be in an area with GSM coverage, but this is extensive, and no other networks have a greater coverage. Before going out, using an app, website or text messages, the rider nominates contacts that he/she would like to be contacted in the event of an accident. When an accident is detected an alert is then sent to these contacts, giving a location that can be passed to the emergency services. Lanyards can be pulled out accidentally by branches or when dismounting without remembering to turn off the device. Motion sensors can detect a normal (if violent) riding event as a sudden fall. And you can just stop riding for a few minutes triggering a GPS motionless alert. So all accident detection systems are capable of having false alarms. To deal with this, the first thing all systems do is take a pause (a cooling off period) after detecting an accident (a rider can plug the lanyard back in, for example). Some give an audible alarm and vibrate to let the rider know that an alarm is about to be sent. This works with a ‘Stop Alert’ button that allows the rider to cancel the alert. The most sophisticated systems use a combination of accelerometer data, GPS data and a cooling off period to reduce the chance of a false alarm and give the rider the opportunity to stop an alert. Additionally, one of the motion sensing systems allow riders to vary the length of time they need to be motionless to trigger an event. This app based system also allow riders to vary the time they have available to cancel an alert. These options allow equestrians to fine tune their safety system to their personal preference. Some of the available solutions are products built specifically as equestrian safety devices. Others reduce costs and leverage the power of the smartphone with it’s inbuilt GPS and Accelerometer to provide an answer. Which suits a rider will depend on personal preference. Lanyard systems are straightforward to use but are another piece of kit to remember. They also are more expensive to buy. Apps on a smartphone are familiar territory for many and the phone is already an equine safety essential. Ridersmate was an early provider and brought its lanyard technology over from the motorcycling world. Ridersmate can’t vary sensing or notification timings. The second lanyard user is Peiker Consumer Electronics Evolution who are using this system for their (not yet released) CEECALL product. Unclear if possible to vary sensing or notification timings. EquiSure combines Bluetooth proximity and accelerometer fall detection in its bespoke device that will be released in June 2018. Equisure can’t vary sensing or notification timings. Horse Rider SOS is a smartphone app that uses (a lack of) accelerometer motion sensing to detect accidents. Horse Rider SOS can’t vary sensing or notification timings. Huufe provides a combination of accelerometer and GPS motion sensing in its premium feature SafeRide. 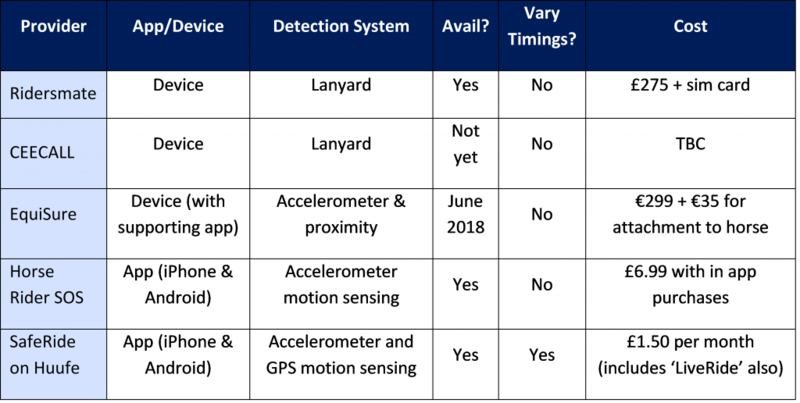 SafeRide can vary sensing and notification timings. EquiSure and Huufe (LiveRide) also include a live ‘real time’ tracking capability allowing riders to nominate people who can then remotely follow them as they ride. Stable or yard managers, friends or parents can follow where a rider is at all times on a map they view on their mobile or PC. Some providers also incorporate ‘Emergency SOS’ or ‘Panic’ Buttons. Something worth considering if it is a feature you would like. In this blog, horse riding accident detection and horse riding accident notification are considered the same as equestrian accident detection, equestrian accident notification, equine accident detection and equine accident notification.